Want to embrace plant power when it comes to your food but don’t want to give up all your favourite junk foods? Enter V-Rev, Manchester’s king of celebrating the huge positives of a vegan lifestyle…but in a really dirrrty way. When stepping inside and trying to get a sneaky peek of what everyone else is having you’d be forgiven for doing a double take when you clock their plates, questioning if you’re really inside a vegan diner. With juicy looking burgers stacked high with pickles, cheese (or cheez as it’s known here) and ‘baecon’, golden fried buttermilk seitan chicken which, in one case, is even encased between two fried donuts, jumbo hotdogs covered in vegan sauces, and deliciously gooey mac n cheez, food envy is inevitable as due to the size of the dishes you’d be wheezing on the floor in the food coma to end all food comas if you tried it all in one go - and that’s not even taking into account their ridiculously indulgent ‘milkshakes’ and desserts. With names like Donut Stop Me Now, Fre sh a voca do, and Whopper Way to Make a Living, V-Rev may take the quality of its 100% plant-based menu seriously, but their sense of humour is there for all to enjoy. 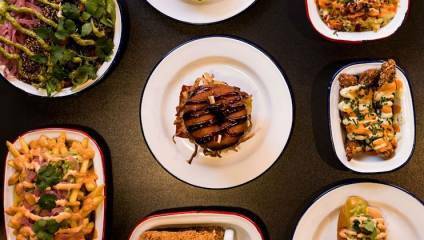 If you weren’t a little bit in love with them already, then you will be when you learn that not only is the food available for delivery, but all their packaging is biodegradable and plastic free, meaning although the food may taste sinful, the whole V-Rev experience is a little slice of Vegan Heaven. What? A cosy, plant-festooned restaurant championing Vegan and Gluten Free food. Why? You’ll go for their signature cauliflower hot wings; you’ll stay for their passion for creating fantastic flavour combinations from fresh local ingredients. Why? Although not strictly vegan, their vegan brunch and cake options are plentiful. From classic avo on toast to their Cowboy Beans and Hash Brown stack, it’s the perfect start to the day. Why? Starting off in Leeds and soon to spread to Liverpool, Bundobust has made a name for itself thanks to its inventive menu bringing a spicy punch to plant power.